ANTIQUE VICTORIAN SILVER 4 PIECE TEA SET LONDON 1852/3. A 4 piece Victorian Silver octagonal shaped Tea Set which includes a coffee pot, tea pot, sugar basin and cream jug. This substantial tea set is embellished with a rich engraved pattern. Each piece stands on four decorative feet and have attractively embellished handles. The inside of the Milk and Sugar are gilded. This item is in very good condition and each piece is hallmarked. Maker J & A Savory. Total Weight 75oz / 2325g Approx. Height Coffee Pot 282mm / 11 inches Approx. Height Tea Pot 215mm / 8 ½ inches Approx. Height Sugar 150mm / 6 inches Approx. Height Cream 169mm / 6 ¾ inches. 75.00 Troy Ounces (2332.50 grams). 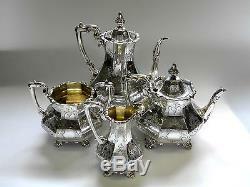 The item "ANTIQUE VICTORIAN SILVER 4 PIECE TEA SET LONDON 1852/3 incl COFFEE POT" is in sale since Tuesday, April 9, 2013. This item is in the category "Antiques\Silver\Solid Silver\Teapots & Sets". The seller is "antique-silver" and is located in LONDON. This item can be shipped worldwide.